Mix one Betty Crocker™ Super Moist™ yellow cake mix according to package instructions, swapping out whole milk for the water. 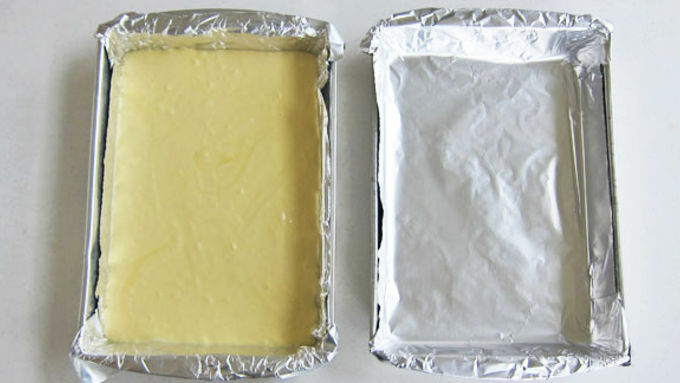 Fill a 9 by 13 baking pan with batter. For ease of removal, line the baking pans with non-stick aluminum foil. Repeat, making a total of three 9x13 cakes. Bake cakes according to package instructions. Remove cakes from oven and allow to cool completely. Cut the rounded part of the top of each cake off, leveling each into a nice even thickness. As you work, you need to reserve all your cake scraps. These particular scraps will work nicely to make the cubes for the stuffing. 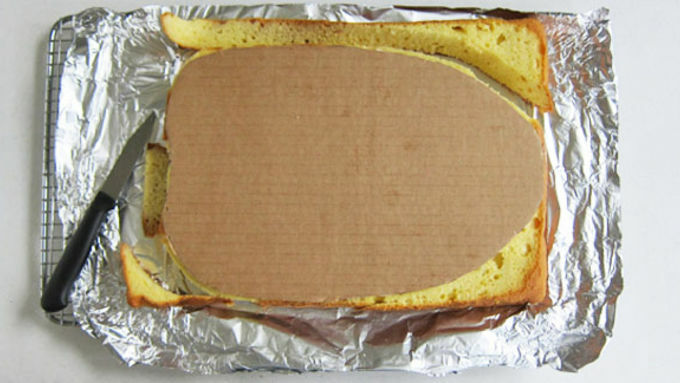 Cut a cake board into the shape of a roasted turkey. 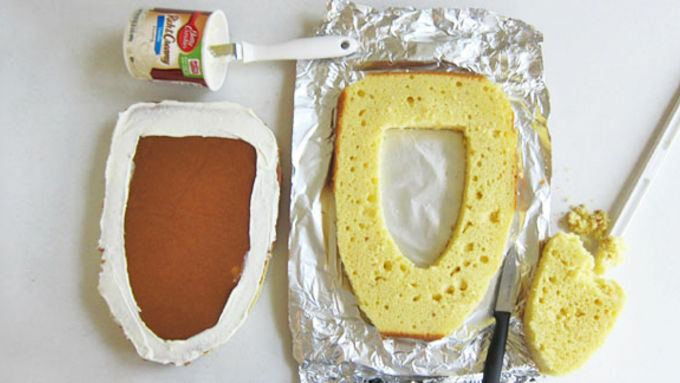 Use it as a guide to cut all three cakes into a turkey shape. 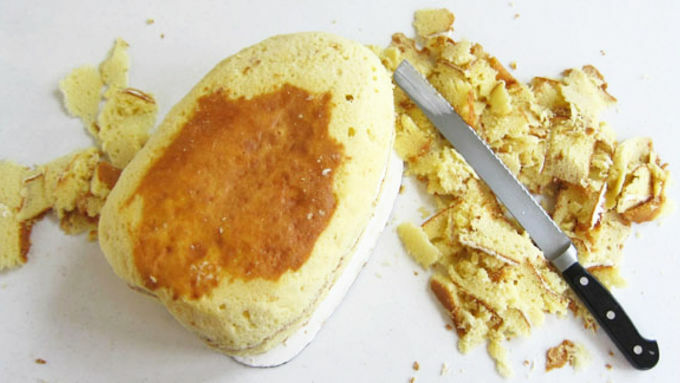 Freeze cakes for at least 3 hours, to make them easier to handle. Note: At first, I didnt do this, and broke a cake trying to layer them. Dont skip this step! Place one cake on the cake board. Use Betty Crocker™ Rich & Creamy vanilla frosting to frost just around the edge of this cake. 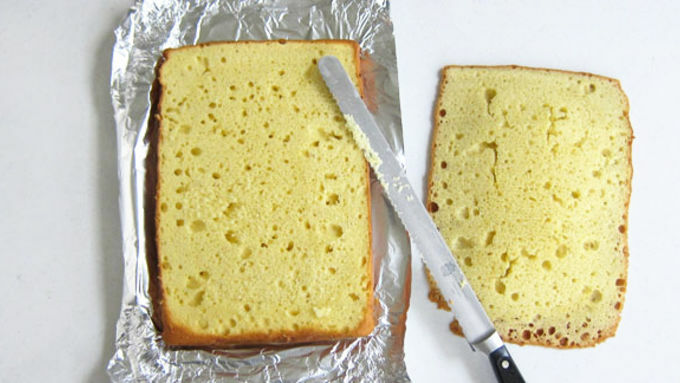 Cut and remove a hole from the middle of another cake, this will be the well for the candy. Place that cake on top of the bottom cake. 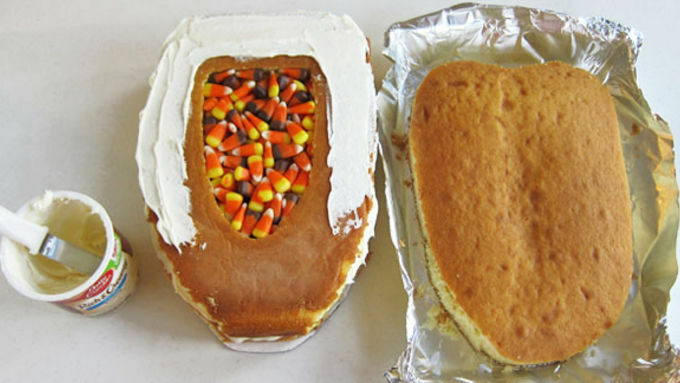 Fill the well in the second cake with candy corn, or any other candy youd like. Frost around the edge of that cake, making sure you dont get the frosting really close to the candy well. Place third cake on top. 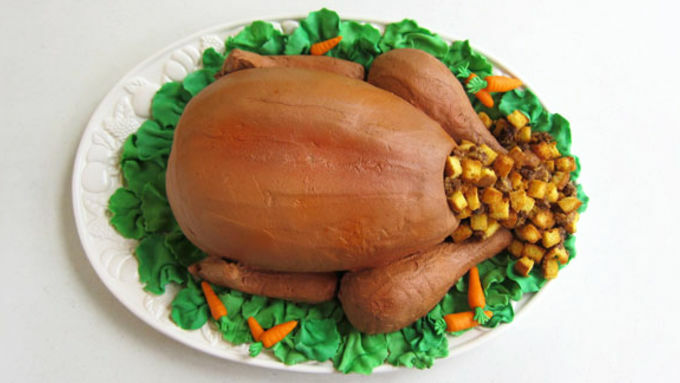 Use a serrated knife to carve the cakes into a the shape of a roasted turkey. Add a cavity at the more pointed end of the turkey. Use a spoon to scoop out a hole for the turkey cavity. This is where the stuffing will go in the finished cake. Pour three tubs of Betty Crocker™ Rich & Creamy vanilla frosting into a mixing bowl. Stir in 1/4 cup cocoa powder and some Betty Crocker™ orange gel food color. Add more of each until you get the desired shade for your frosting. Frost a thin layer over entire turkey cake. 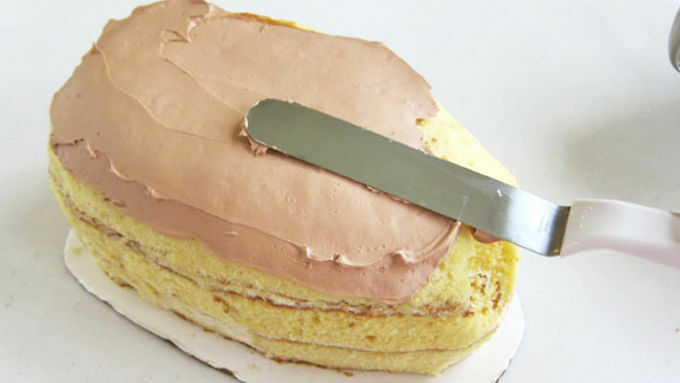 This is not your final coat of frosting, its just to hold in all of the crumbs. Let the cake sit at room temperature for 30 minutes so the crumb coat dries a bit. Put a thicker second coat of frosting all over the cake, building up the areas that need some structure, like the backbone area of the turkey. 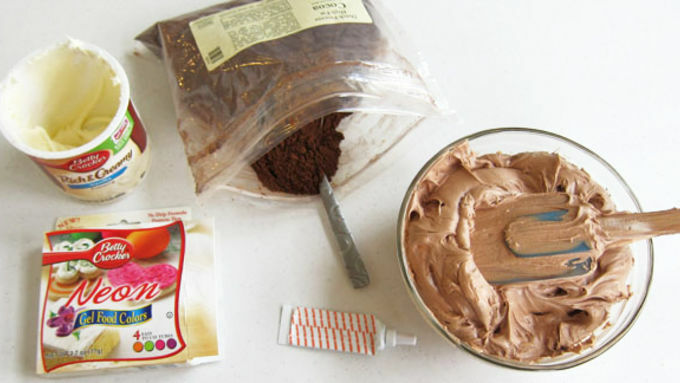 Allow frosting to dry while you make all the other components of the cake. Cut some of the cake scraps into small 1/2 inch cubes. Place in a single layer on a baking sheet and bake in a 350°F oven for 12-14 minutes until golden brown and nicely toasted. Crumble all the remaining cake scraps into a bowl. Add a few spoonfuls of vanilla frosting and mix until the cake all holds together in a ball, adding more frosting as needed. To make the turkey stuffing, break off small jagged looking pieces of the cake/frosting mixture and dust them with cocoa powder to look like "sausage". 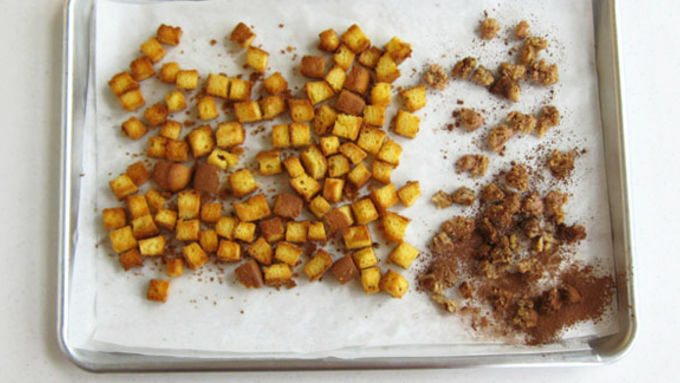 Toss together with the toasted cake cubes. Set aside. Set the turkey cake on a platter or in a roasting pan. 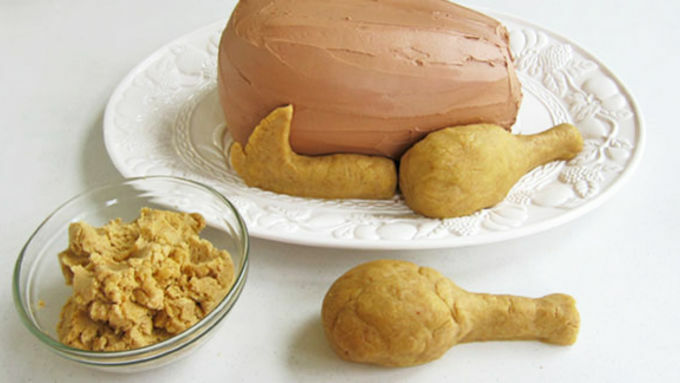 Use the remaining cake/frosting mixture to sculpt two large turkey legs and two wings. Attach them to the cake. Frost the legs and wings and allow the frosting to dry. Once the frosting has dried to the touch, press a paper towel that is imprinted with dots, all over the cake to make it look like realistic turkey skin. If the frosting sticks, allow it to dry longer. Optional - spray orange. 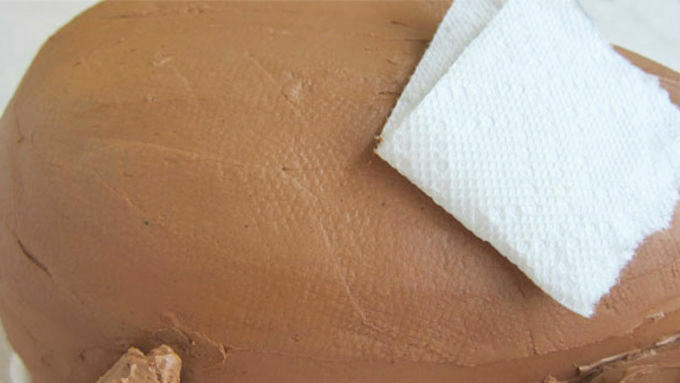 brown, and red food coloring over the cake to add shading and highlights either by using an airbrush or by using spray mist food coloring. Optional - create lettuce and carrots using colored fondant. Add the stuffing to the turkey, filling the cavity and allowing it to spill out onto the platter. 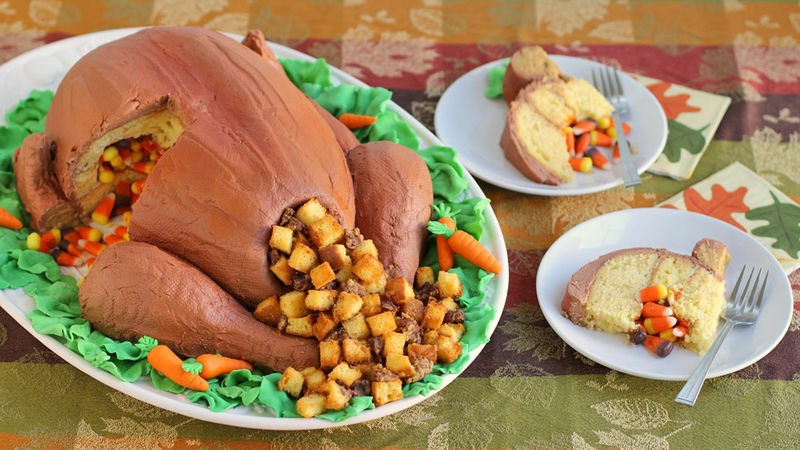 If you made fondant lettuce and carrots, arrange them around the turkey on platter. 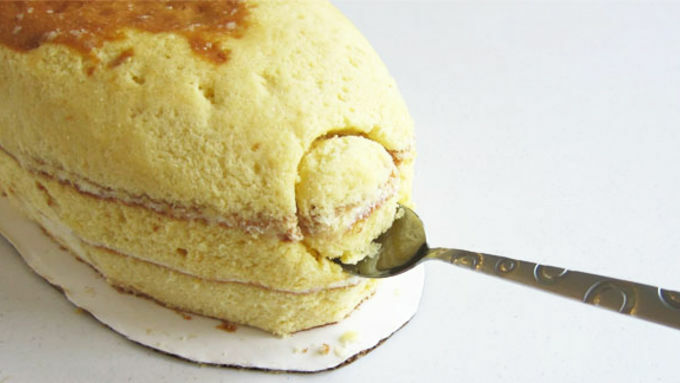 You may store the cake at room temperature for up to two days before serving. The longer it sits the more moisture will accumulate on the candy inside the cake. When serving the cake, you might want to add some more candy to each dessert plate. 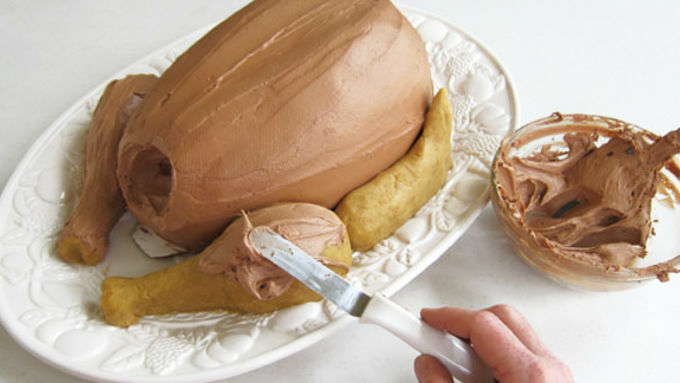 Surprise your family this Thanksgiving by serving a roasted turkey…for dessert! Then, wow them even more when you cut the first slice and candy corn comes falling out! This piñata style cake is a fun way to feed a big crowd. It's not only stuffed with candy, but also filled with a sweet take on Thanksgiving Day stuffing! 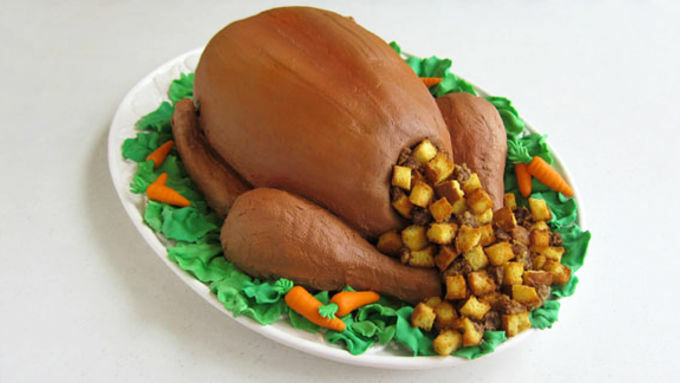 There are a few ways to serve a turkey cake, either on a platter or in a roasting pan filled with real (or fondant) fruits, vegetables, and herbs. I chose to make some lettuce and carrots out of fondant, which added a nice pop of color. 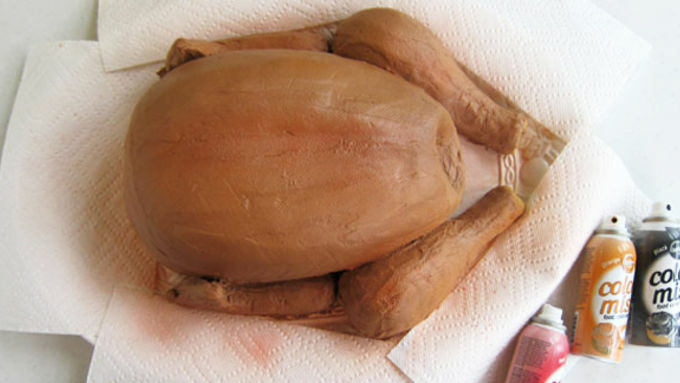 If you own an airbrush, you can spray the turkey with some orange, red, and brown to give it a realistic look. I used some spray mist food coloring to add some dimension to my cake. The cake looks great just frosted too, so this is an optional step! 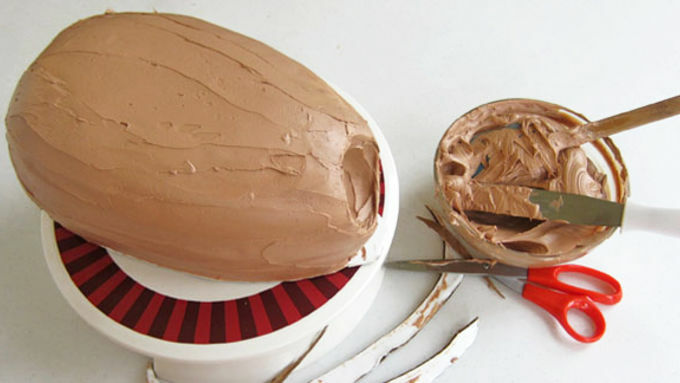 Another optional step is creating some vegetables or fruit out of colored fondant or modeling chocolate. I made lettuce and a few carrots. You can also just use real vegetables, fruits or herbs to adorn your platter. This cake will keep at room temperature for up to two days. The longer it sits, the more moisture will accumulate on the candy inside the cake. I always add a bit more candy to the cake as I'm serving it, just to add more color to the dessert plates. Serve this turkey cake to your Thanksgiving guests for a fun, surprising dessert!